When other users receive a notification that you followed them on Twitter, there’s a good chance that they will click through that email to check out your profile. When they hit your profile on Twitter, you have about 10-15 seconds to impress them enough that they will follow you back. Given that you only have a few seconds, are you providing the right information in your profile, is there enough information, is it accurate, and can they get a feel for who you are and what you do? These are all good questions that you should be thinking about. When I’m helping clients with Twitter marketing, I often get questions about what to tweet, Twitter etiquette, who to follow, how to engage users, etc. However, it’s usually not long before the topic of Twitter profiles come up. For example, what should be included in a solid profile, what should the bio include, what should your avatar look like, should you link to a website, blog, etc? Although profiles on Twitter are relatively simple, they are definitely important. Your profile is often your first impression on Twitter, so it’s important that you put your best foot forward. And that’s especially true when you are first starting out on the microblogging service. In my opinion, you can really shoot yourself in the foot if you don’t understand what other people are looking for on your profile. Based on what I explained above, I thought it would be a good idea to provide the anatomy of a Twitter profile review. I’ll explain the core elements of your profile that other users are reviewing, provide best practices for fleshing out these elements, and explain how your profile can impact your follower count. If you are new to Twitter, my hope is that you can leave this post and make sure your profile is helping you versus hurting you. Without further ado, let’s dig into Twitter profiles. Note, I’ll simply use screenshots from my own profile in order to highlight each profile element. When you receive email notifications about new followers, the first thing you’ll see is the person’s name and Twitter handle. 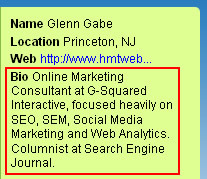 It might look like “Glenn Gabe (glenngabe) is now following your tweets on Twitter”. 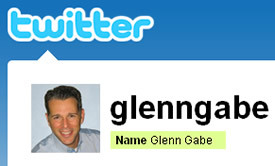 A Twitter handle is essentially your username (in this case glenngabe, all as one word). I highly recommend using a handle that ties directly with your name, brand, or company name. I would not get too creative here… If your first impression with someone is corny, weird, ambiguous, or offensive, then you might kill your chances of a follow back almost immediately. For example, “Money Man Jimmy is now following your tweets on Twitter” (with a handle of @moneymanjim) won’t necessarily be a great move for you. Since there are many spammers on Twitter, I probably wouldn’t even click through to a profile like that. Don’t make the mistake of alienating Twitter users before they even reach your profile. In addition, you can view their avatar in the notification email (the image that someone uses to represent their account). This too can be a telling story. Is the avatar a headshot of the person, a logo, a funny image, cartoon, celebrity photo, is it blank, or is it something even worse like a risky image? Be careful with the avatar you choose. Again, this is your first impression. Twitter is so much about personal engagement that I almost always recommend using an actual photo, if possible. Remember, you’ll be engaging other people on Twitter, so you typically want to know that an actual person is on the other end. If you’re a company that’s setting up a company profile, then you can use your official logo (although I’m not a big fan of following logos). If you’re a recognizable brand, then it’s a different story. But most companies aren’t recognizable brands… Also, if the person managing your account is your social media manager, then I have no problem letting that person use their own photo, as long as their bio explains what they do (more on that soon). My recommendation: Use a descriptive handle (something close to your name if you can get it), use an actual photo of yourself as your avatar, and use your real name as the name on the account. 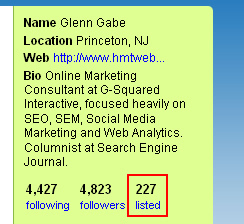 If you do that, other users will know that Glenn Gabe (@glenngabe) is now following them (and they can check out an actual photo). You’ll start off the right way, and will give yourself a greater chance of gaining new followers. When you meet someone for the first time at a meeting or conference, what do you say to them? Do you crack a joke during that first exchange, do you say nothing, or do you succinctly introduce yourself by providing your name and what you do? For most of us, it’s the latter. I believe that it’s extremely important to list your full name in your profile, as well as a thorough bio. “Thorough” is a relative term given you only have 160 characters to play with, but you can still get enough in your bio to clearly state who you are and what you do. When reviewing someone’s profile, I look to see if the person has their full name listed and if they have created a bio. I typically won’t follow someone back if they just have a partial name listed, along with a thin bio. Let’s face it, if you are looking for a lot of privacy, then Twitter isn’t the place for you. If you check my bio, you can see that I provide my full name, my company name, the areas of online marketing that I focus on, and a link to my blog. More about profile links later. You can quickly get a feel for who I am and what I do. If you leave some of this information out, you risk not being taken seriously. That means you might limit the amount of people that will follow you back. And that’s not good, especially when you’re new on Twitter. When you’re just starting out on Twitter, it’s hard not to have follower-envy or a complex about the number of followers you have. Typically, nobody knows who you are, nobody cares, and nobody is chomping at the bit to follow you. You’ll be caught in the black hole of Twitter for a while. During the process of growing your Twitter account, almost everyone ends up following more people than they have followers (and that’s for a while). 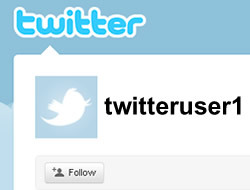 A normal follower to following ratio will be closer to 1:1 (for most users). For example, someone might have 1500 followers and they are following 1350. That ratio is much stronger and looks more legitimate than someone following 7500 people with only 1500 followers. As people become more popular on Twitter, they might have more followers than people they follow, but the ratio will often still look normal. For example, someone might have 8000 followers, but they are still following 5000 people. As you get used to Twitter, you can tell pretty easily what’s legitimate and what’s not. If you see someone following the world without many followers, then you might want to explore their profile before deciding what to do. Also, after I check someone’s follower count and follower to following ratio, I often check the number of tweets they have (to see if that number is in line with the number of followers they have). More on that below. How Many Tweets Do You Have? On Twitter, you have the ability to provide a link in your profile. I believe it’s important to include a link to build more credibility. For example, many people link to their website or blog. You can also point to your LinkedIn profile, Facebook profile, etc. On Twitter, it’s not unusual for someone to check out your profile and then click through the link you provide to see what you’re all about. I see many visits from Twitter to my website. Again, think about meeting someone for the first time. If you didn’t tell someone where you were from and what you do (with some backing), you would have a hard time building up credibility. I highly recommend providing a link and making the destination something that helps you build credibility. Some people use shortened URL’s in their profile, such as using a bit.ly link. I’m not a big fan of doing this, since you don’t know where the link is taking you. There are a lot of scammers and spammers on Twitter and links can potentially take you to malware, scams, etc. Therefore, I recommend providing a full link to your blog or website (something people can clearly see). If you go to my profile, you’ll see a raw link to my blog (using my domain name). Again, you want to make it easy for people to learn about you. Don’t make them think too much. You could end up losing potential followers. 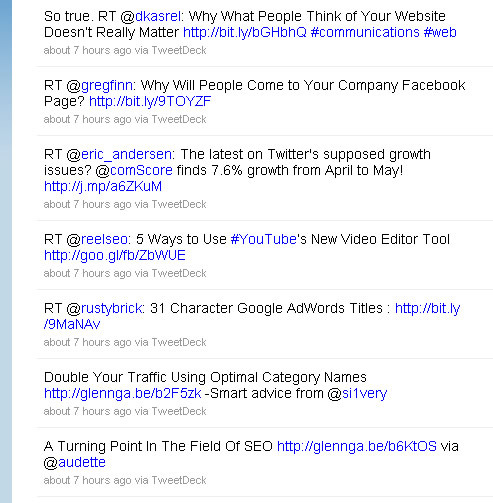 Lists on Twitter enable you to organize certain users into categories. Typically, you only list someone if you think highly of them. For example, if you were a PR executive, you might list several thought leaders in a list titled “PR-Leaders”. So, the number of times that users have been listed is a metric that some users look at to see what other people on Twitter think of them. To me, that number doesn’t have to be incredibly high, but should make sense given the other elements I’ve listed in this post. If you see that someone has been listed even 5 or 10 times, that might be fine. If you see a very low “listed count”, then you should understand the context before making any judgments. For example, are they brand new on Twitter? If so, then it makes sense that they haven’t been listed much. If they have 2000 followers and haven’t been listed once, then that might be a red flag. You will naturally be listed over time if you are doing the right things on Twitter, but that’s for another post. What Are Your Last 20 Tweets? When Is the Last Time You Tweeted? When you check the last twenty tweets from a user, you can also check the last time they tweeted. That’s important, since you might see that their last tweet was over a month ago (or worse). In a perfect world, you would see that someone last tweeted less than 24 hours ago. Even better, you would see some tweets from just a few minutes or hours ago. You don’t want to end up following a lot of people that don’t post updates! That’s the antithesis of a good Twitter user and a waste of time for you… This is also why I recommend that you tweet daily. Not doing so can result in losing potential followers. I never like seeing that a user hasn’t tweeted in days (or longer). Summary – Do You Need To Tweak Your Profile Now? If you’re new to Twitter, you might be surprised to learn that a Twitter profile review is not so simple! As you spend more time on Twitter, you’ll understand more about the importance of each element listed above. When you break it down, Twitter users don’t want to get gamed, they don’t want to follow spammers, and they don’t want to bog down their accounts by following zombie users . That’s why you should spend some time and make sure you are providing the right information in order to make a great first impression on Twitter. Remember, you will have potential new followers checking out your profile on a regular basis. You just need to make sure you can convert them to followers. Unfortunately, many people are not doing a great job at this. My hope is that you can. Hey Glenn, Excellent info for Twitter Newbies!!! This is a great post. Very similar to Ryan, my company has created a flowchart that helps to determine whether to follow back someone who is already following you on Twitter. I hope it helps readers of this blog post. I view this very differently. On Twitter, it’s manageable to follow somewhere between 200-500 people; above that, you’re merely dipping into the stream. Today, I follow about 300 people and have 1,100 followers. I probably follow back 1 of every 20 or so new followers. It’s great that others find me interesting but if your tweets aren’t relevant to what I do, I’m just not going to follow you. 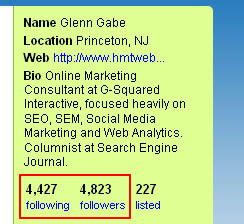 In fact, when I see that a user has 4,000 followers AND follows 4,000 people, I am LESS likely to follow them. It tells me that either a) they auto-follow people back or follow everyone who follows them; or b) they are a spammer who follows a bunch of people, then unfollows those who do not follow back, and repeats the process. Follower:following ratio is critically important, but only following a fraction of those who follow you is probably an indication that you DO interact with those you follow. That’s why you keep it to a manageable list. @Barry, thanks for your comment. I definitely see your point, but there are a few things I wanted to address. First, I never said it’s critical to have more followers than people you follow. I actually know some very smart people that I would consider thought leaders in online marketing that follow more people than they have followers. As time goes on (and if you are doing the right things on Twitter), many people end up having more followers than people they follow. But it’s not critical for that to happen. Second, using an app like Tweetdeck enables you to add several users to various lists/panes, which enables you to follow and engage many more people than trying to follow a single stream of updates. So I agree it’s tough to follow a lot of people, but apps help filter segments of users. Third, you are missing a critical part of engagement on Twitter if you are only following a handful of people. The reason is because users can only DM you if you’re following them. I’ve had many people on Twitter direct message me about various things. Without that access, I would probably miss out on a lot of conversations. And some of those conversations have led to incredible opportunities. So, I definitely hear what you are saying, but I’m not sure we’ll agree on the follower/following ratio. Thanks again for your comment, though. I’m a big use of Tweetdeck (desktop, phone & iPad). I’m also a big list user. One of the things I love about lists is that it’s allowed me to unfollow a bunch of people, yet move them to a list. there are lots of people whom I find interesting, but whose constant tweets simply create too much noise (think Scoble or similar). I keep these people in lists where I can “dip in” from time to time, but it doesn’t create so much noise that I miss the key tweets from those whom I follow closely. As for the ability to DM, I’ve not found that a problem. More than a few times I’ve had someone @ me saying “please follow me so I can DM you a message” and I’m always happy to comply. Everyone uses Twitter for their own purposes. For me, I’d prefer to develop deep relationships with a smaller group of people (some of whom I also know offline, but others whom I’ve only met online) and more casually monitor the wider audience. the key is finding what works for you. Barry, I think you bring up a great point. There’s not a single, right way to use Twitter. You need to find what works best for your needs and run with it. Regarding Tweetdeck, I couldn’t imagine Twitter without an app like that… :) Regarding direct messages, I see your point. I’m a bigger fan of just letting people that I follow freely DM me. But that’s just my opinion. I’m ok with that because I literally check each person that follows me before following them back. If I follow them, then I’m cool with them DM’ing me. Well I am agree with you at most of the point but what I think is having more and more listed will always be a plus point either directly you are getting benefit or not. It builds your credibility so far I think. Thanks for nice post and carry on with such more good stuff. Awesome post. This is definitely one I’m going to hold on to and show clients. It’s amazing how much thought needs to go into something that looks so simple. But I know first hand what a good profile can do for you. It really shows people what you’re about and how serious you are about the platform. Thanks Seth. I appreciate it. I agree, I think a lot of people don’t understand what’s going on during a Twitter profile review. Understanding these elements can only help your efforts on Twitter!